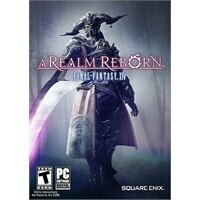 Final Fantasy XIV: A Realm Reborn - WindowsFINAL FANTASY XIV: A REALM REBORN is a massively multiplayer online role-playing game that invites you to explore the realm of Eorzea with friends from around the world. Form a party and adventure with a multitude of players from across the globe. Forge friendships, mount chocobos, and board airships as you and your companions create your own unique stories in Eorzea. Set out alone of enlist the aid of friends as you undertake epic quests, battle familiar FINAL FANTASY monsters, and acquire unique abilities and equipment. All the classic elements from the series that you have come to know and love are waiting! Collect five beautiful character art cards found only in the Collectors Edition. Explore the world of Eorzea with this collection of never-before-seen concept art bound together in a high quality hardbound art book. Use this security token to enhance the security of your account and protect it from unauthorized access. FINAL FANTASY XIV: A REALM REBORN is a massively multiplayer online role-playing game that invites you to explore the realm of Eorzea with friends from around the world. Form a party and adventure with a multitude of players from across the globe. Forge friendships, mount chocobos, and board airships as you and your companions create your own unique stories in Eorzea. Set out alone of enlist the aid of friends as you undertake epic quests, battle familiar FINAL FANTASY monsters, and acquire unique abilities and equipment. All the classic elements from the series that you have come to know and love are waiting!